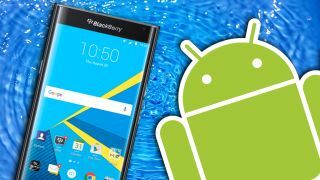 BlackBerry is back at bat with Android, with reports that the phone maker is making three new - and possibly last - smartphones over the course of this year and next. Unlike the Blackberry Priv - the company's first Android-powered handset - the upcoming Google operating system-powered phones could offer a wider range of prices for the wallet-conscious, as noted by Phandroid. While the handsets have yet to be formally announced, VentureBeat's oft-reliable Evan Blass reports the codenames for the phones are Neon, Argon and Mercury. Blass, a.k.a. renowned leaker @evleaks, also spilled the devices' specs and potential price schemes. Due out this summer, the BlackBerry Neon is said to sport 3GB of RAM, 16GB of storage, a 5.2-inch display, touchscreen keyboard, and a more consumer-friendly price. Next, the BlackBerry Argon will possibly launch this October with a 5.5-inch display, 32GB of storage, 4GB or RAM, and a fingerprint scanner. This last would be a welcome feature for BlackBerry's key demographic of government workers and industry executives handling sensitive information. Finally, due out in Q1 of 2017, the BlackBerry Mercury will be the only one of the three Android models equipped with a classic, clickety physical keyboard. The Mercury is also expected to house 3GB of RAM, 32GB of storage, and a juicy 3400mAh battery - another eye-catcher for those aforementioned executive types. Following the poor sales of the Priv, attributed in part to its steep price, BlackBerry says 2016 will be a make-or-break year, with the Neon Argon, and Mercury possibly being the last smartphones put out by the company if they don't turn a profit. So, no pressure or anything.